Pour all of the ingredients into a medium bowl. Toss to incorporate ingredients and serve. For the mother of all games, you definitely need the mother of all snacks. And man can you feel the testosterone flowing through this one – ohhh boy! The big game is almost here and I can’t wait to get together with my friends and family to eat some good grub and watch the game. Between you and me, my favorite part is actually the commercials, but we’ll keep that on the down low. This Super Snack Bowl is so hearty that it could be a meal in itself. Stick a fork in it, dinner is done. 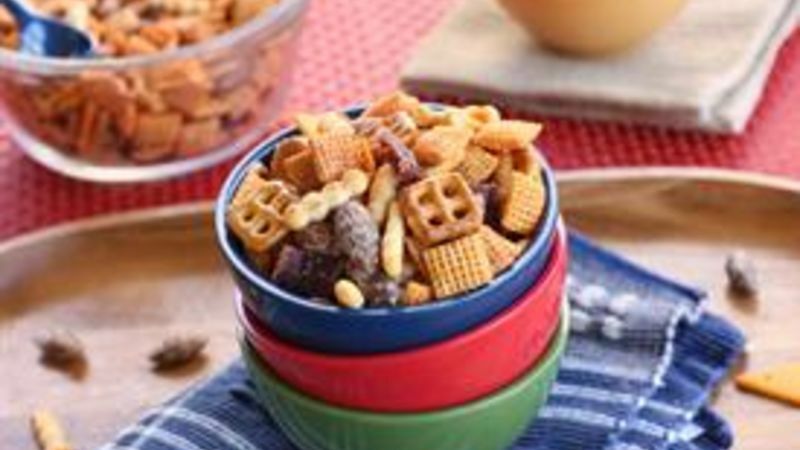 This is “Man Food” at its finest -- chunks of beef jerky, spicy nuts, cheddar Chex mix, and cubes of cheddar cheese (because really…can you ever have too much cheese?). I consider myself an expert in football food and I know without a doubt that a meaty, cheesy, crunchy, give-me-a-drink-spicy snack is for sure to be a hit with the guys. I used wasabi and soy sauce almonds in our Super Snack Bowl because they’re my husband’s favorite, but you can definitely throw in whatever spicy nut you like. In less than five minutes you can fix this one-stop Super Snack Bowl to feed the hungry fans. Can’t you just hear the grunts of satisfaction already? The big game means a big opportunity for snacking. Try some of these munchy recipes to keep fan hands happy!